At the start of April, CloudTrade heads to Austin, Texas to participate in SAP Ariba Live, the largest procurement and supply chain event in the world. SAP Ariba is one of the world’s most respected e-procurement and supply chain cloud solution providers. They’re a company we greatly admire and attending their event is always great fun and full of opportunity. I met SAP for the first time about 4 years ago and attended the recent Live events in Prague and Amsterdam. Austin is up next and then we’re heading to Barcelona in June. Live is the largest procurement event in the world, bringing together over 3,500 buyers, suppliers and business professionals for discussions around technology, innovation and trends that are shaping the world of business commerce. We’re pleased to say that CloudTrade's relationship with SAP runs deeper than just attending their events. We're proud that our technology has been recently integrated into the SAP Ariba Network. As per our standalone product, our partnership with Ariba makes the process of uploading information into the Ariba Network automated, reducing keystrokes and potential errors that can have implications further downstream. The huge benefit for suppliers is that they can now enjoy seamless batch upload or email submission onto the Ariba platform, whilst buyers don’t have to add any additional data points, getting all the data they require uploaded directly into their ERP system. This is done at no additional cost and considered part of Ariba’s service offering. Our partnership has offered this solution via the Ariba Network since September last year. To date, we have over 300 selling and 50+ buying organisations using the solution in some 12 different countries. These numbers are set to grow and we've been told that our solution is one of the key reasons why buyers and suppliers are choosing to use the Ariba portal, as it’s setting Ariba apart from their competition. The potential to grow this partnership is great. Our technology is scalable, hence one of the few barriers to growth that we have is getting people to know about our role as the software authors for the PDF solution that Ariba now offers. 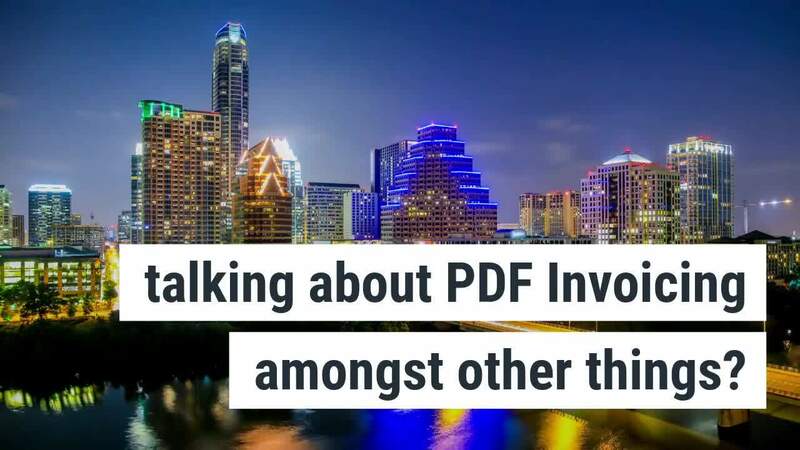 That's one of the reasons why we're heading to Live in Austin, where we will be looking to connect with as many systems integrators, buyers and sellers as possible. We're also going to be talking about a new solution that we're rolling out alongside Ariba, the CloudTrade PDF Invoice app. Currently, the Ariba Network Gateway can upload about 120 data items. Our new app is going to allow buyers to subscribe to a service where they can customise the output. For most users, 120 data items is adequate but we know larger corporates need a bespoke output. Our solution creates customised data fields that can meet all ERP data requirements and it's all downloadable via the SAP App Centre. Find us at Live to talk about this development further. We’re looking forward to visiting Austin, which has become a hub for America’s entrepreneurial and technological spirit. Proud about “Keeping Austin Weird” (the slogan adopted by the Austin Independent Business Alliance) the Texan capital remains among the most unique cities in the US, famous for its music, food and thriving business community. Excitingly, Simon Sinek, famous for delivering one of the most popular TED Talks of all time, titled Start With Why, will also be delivering this year’s Live keynote. If you’re attending Live, come and find us, you won’t miss us, just look out for two weird Englishmen brandishing CloudTrade paraphernalia – that's free handout’s to you and me!